Need a little retail therapy? Pennsylvania’s awesome malls and outlets will bring you everything from designer finds at bargain prices to the latest in trendy sneakers. From massive malls in King of Prussia to cute shopping villages in Lahaska, here are the best places to shop till you drop in Pennsylvania! Did you know that the Mall of America no longer holds the title of the largest mall in America? Now, the King of Prussia mall does! Spanning an astounding 2.9 million square-feet, the King of Prussia mall is packed full of stores and restaurants everyone in the family will enjoy. Even grandma! If she can get around, that is. Philadelphia Premium Outlets boasts 150 different stores and restaurants for shoppers of all ages to enjoy. You'll find name brands and popular designers at a deep discount—25 to 65 percent, to be exact! Whether you're from the local area or are just passing through and love to shop, we know you'll find something to love about Philadelphia Premium Outlets. In Pennsylvania and beyond, Tanger Outlets aims to bring shoppers the "latest and most popular retail brands," and at a significant discount, at that. At their three Pennsylvania locations, you'll find stores like Coach, Michael Kors, Polo Ralph Lauren, Old Navy, and many, many more. Want to save even more, and get access to exclusive gifts? Then don't forget to join TangerClub! Lehigh Valley Mall is a "super-regional, two-level" mall serving the areas of Allentown, Bethlehem, and Easton from its Whitehall, Pennsylvania location. The mall features 150+ stores, ranging from department stores to specialty retail, and women's and children's apparel. In addition to the mall itself, there's also an outdoor Lifestyle Center attached for all patrons to enjoy. Peddler's Village has been a Bucks County favorite since its inception. With its historic, colonial-style buildings, beautiful gardens, unique shops, and delicious dining options all within walking distance, it offers a truly unique experience to visitors of all ages. It's everything but ordinary. Keep an eye on their calendar for regular events—like the annual blueberry and strawberry festivals sure to draw a crowd. At the Willow Grove Park Mall, shoppers with an interest in fashion and experiential retail are the primary demographic. There are over 130 stores in the mall, including high-end retailers like Apple, Primark, LOFT, H&M, and more. Once you've worked up an appetite, you can grab a bite to eat at one of the mall's restaurants like the Cheesecake Factory or TGI Friday's. For shoppers in Scranton and the surrounding areas, The Shoppes at Montage are the first choice for shopping. 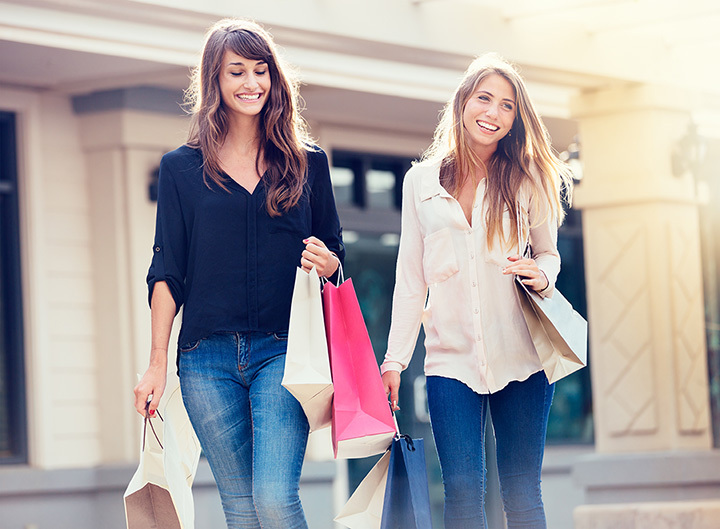 Offering merchants like Charming Charlie, DSW Shoes, GameStop, Sport Clips, and many more, The Shoppes at Montage provides patrons with a well-rounded shopping experience they won't forget. Are you looking for hot brand names and designer stores? What if we let you in on a little secret: Grove City Premium Outlets offers over 120 of them! Here, you'll find the likes of J. Crew, Coach, Vera Bradley, and Nike, to name a few. Save 25-65 percent every day, but don't forget to sign up for the VIP Club, too—and you could save even more. Located in the Pocono Mountains region, the Crossings Premium Outlets features 100 outlet stores—like The North Face, Under Armour, Michael Kors, and Gap. There are plenty of dining options as well—both in the food court and the Log Cabin Bar & Grill. Philadelphia Mills may not be the largest mall in the nation, but it is the largest outlet mall in the city. Boasting over 200 stores, you'll find clothing for your whole family, jewelry, and footwear, so you can get the look you're after. Make a day of it and see a movie at the nearby AMC Theater and grab dinner, too!